With Waist Deep, Tyrese now joins Harrison Ford (Firewall) and Jodie Foster (Flightplan) as a concerned parent willing to do anything to get his/her child back. Waist Deep is much more of a B movie than the other two, reveling in shootouts and car chases. The tone of the movie goes all over the place, with the focus more on action sequences than a father's love for his child. Oh, it does try to show how far a father will go to get his son back, but everything feels so silly and generic. 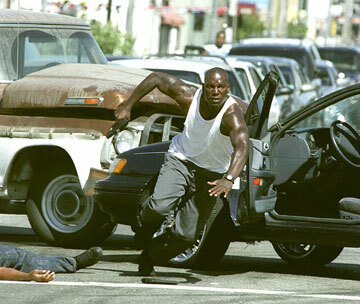 Tyrese (Annapolis, Four Brothers) is O2, an ex-convict trying to get back on the straight track as a security guard. He wants to do right for his son Junior (H. Hunter Hall, Gridlock'd), whose mother abandoned him a few years ago. O2 promises never to leave. He must put that promise to the test when somebody carjacks him, with Junior asleep in the back. It soon becomes clear that one of the local kingpins, Meat (rapper The Game) is holding Junior for ransom. Meat believes that O2 hid $100K from a deal gone bad, which ended up landing in jail. O2 says he doesn't, but has one day to raise the money, lest Meat kills Junior. Along for the ride is Coco (Meagan Good, Brick, Roll Bounce), a small time crook who helped set up O2 for his carjacking. For reasons that never really make sense, she agrees to help O2 steal the money in exchange for half, so she can run away and start over. They come up with an ingenious idea - steal money from Meat and a rival kingpin (Coco's boss) in order to incite a gang war. As one character tells them, they're the "modern day Bonnie and Clyde." Director Vondie Curtis-Hall (Glitter, Gridlock'd) and screenwriters Darin Hood (Caught Up, Sprung) and Michael Mahern (Mobsters) somehow manage to get the duo to come up with unique ways to rob multiple banks, all in one day. The filmmakers use a large anti-violence rally as a means for Coco and O2 to escape easily. The fact that all of a sudden the duo becomes criminal masterminds is a bit far-fetched. Then, things get worse when Curtis-Hall tries throwing in elements of comedy, as well as a sappy romance between the two leads late in the film. The tones shift abruptly and without notice, leaving a jerky feeling to the story. Nothing flows smoothly, and it becomes a bit unintentionally humorous. Tyrese is a commanding actor with a strong presence, but Curtis-Hall stretches reality when she has him portray a father willing to go to whatever lengths possible to save his son. The setup has him as an ex-con, but it's not enough. 1 hour, 37 minutes, Rated R for strong violence and pervasive language.